A garbage disposal unit is usually a very sturdy device. It works brutally on the garbage and gets rid of a lot of trash that you would otherwise have to collect in a container and carry it out all the way to the front yard. When you have a sturdy device, it is not expected to malfunction or stop working. But given the kind of task it does, a garbage disposal unit may malfunction at times. When your garbage disposal unit doesn’t work, it is not always the fault of the system or the company that has manufactured it. Often, it is the nature of your use and what you have subjected the unit to which causes the problem. 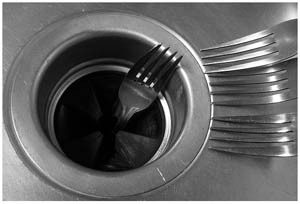 There are many types of problems that you may come across with your garbage disposal. The device may simply not work, in which case there may be a fault somewhere. The device may just have jammed due to some erroneous use, in which case the jam will have to be attended to. Long periods of activity and not attending to its maintenance are usually the two most common causes of garbage disposal not working. First, you should never try and check out the garbage disposal unit yourself, not unless you are trained. You should always hire a plumber, one who is trained at fixing such units. Don’t put in your hand or try anything experimental to know more about the problem. Your garbage disposal unit may just have jammed due to periods of use and owing to the buildup of sediments. Garbage disposal units can crush a lot of stuff but that doesn’t mean you can crush anything down the unit. Glass, hair, grease, rags and similar materials that are hard to get rid of and can jam the unit are the most common causes of a malfunctioning garbage disposal system. The entire unit going kaput is unlikely. What you should do is turn off the system and call in a technician. A technician will attend to the device, inspect it, find the problem and offer you a solution. It usually doesn’t happen that a garbage disposal unit is beyond salvaging or repairing but if that happens, then you have to replace it with a new one or another old one. You should try and use a garbage disposal unit according to the best practices. That will avert almost all potential problems. http://knoxvilleplumbingllc.com/wp-content/uploads/2014/09/garbage-disposal-repair.jpg 204 300 Knoxville Plumber http://knoxvilleplumbingllc.com/wp-content/uploads/2016/09/Website-Logo-KNoxville-Plumbing-2.png Knoxville Plumber2014-03-17 17:12:022014-09-29 17:19:10Why Is My Garbage Disposal Not Working? How to Lower Energy Consumption in Your Home Some Homes In Knoxville Needs to be Repiped… Is Your Home One?